My Kobo copy of Salt Sugar Fat, paired with one of my guilty pleasures. I will admit to a certain amount of soul-searching about my role running and writing for this website. Any thinking person with a basic understanding of nutrition can’t look at a modern supermarket without at least some measure of horror. 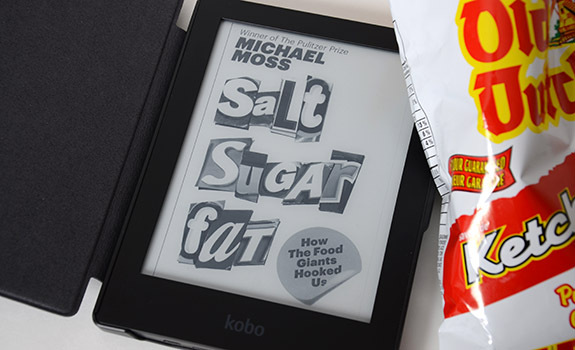 Salt Sugar Fat, journalist Michael Moss’s examination of the three fundamental ingredient pillars of food processing, has been getting a whole lot of press and foodie buzz. It’s understandable, really. Given the depressing rates of obesity and the kinds of extreme foods that draw media attention and feed into our lust for even greater gluttony, it’s pretty clear a whole lot of countries around the world have a food problem. And it’s not the kind of traditional problem where there aren’t enough calories to meet our daily requirements. Instead, it’s a problem of way too many calories consumed with way too much impulsiveness and way too little attention to the consequences. A key part of the problem – and one that the book deals with extensively – is that more and more, nearly everything has become junk food, and the normalisation of our relationship with this food is what’s most concerning. While it’s obvious that a chocolate bar is a guilty pleasure, it’s the other grocery items, combined with an increased frequency of consumption, that have become a greater threat than a bag of jelly beans. Things that used to be healthy (or at least not downright terrible) in moderation have been turned against us, and the marketers and food scientists in the processed food industry have figured out how to game our willpower to a degree that we’ve gone from getting enough of a good thing, to getting more than enough of a good thing, to now getting so much of a good thing that it’s having a profound effect on our health. Cheese, for example, is delicious. As an occasional treat, it’s great. A small wedge, savoured with crackers and a glass of wine, is flavourful and satisfying. It’s also something that, several decades ago, was consumed in moderation. Now, it’s everywhere. It’s baked into and on top of things or added to a burger/wrap/sandwich for a nominal charge; it’s also a big reason why pizza – North American style, with a thick crust and a generous handful of cheese per slice – has become such a force in grocery store freezers. It’s a way to up the fat, which ups the pleasure and ups the desirability – and brain-craving – of a product that needs an extra hook. The extra cheese also solves another big problem: an oversupply of milk fat from a dairy case now stocked with skim, 1% and 2% milk. Sensing an opportunity, the food processors change the way cheese is made (drastically reducing costly aging time), change the way cheese is used in food and change the way cheese is marketed to consumers. Excess supply problem solved; obesity problem aggravated. There are countless cases like this that Moss delves into in detail without getting bogged down in heavy data dumps. He has a knack of finding the areas that are of interest to a general audience, such as the concept of the “bliss point” of sugar, where science is used to determine the precise point where sugar hits the human sweet spot. The research behind this is fascinating. The section on salt is also bound to be an eye-opener for anyone who isn’t familiar with the subject. The salt in the dinner-table shaker is the least of our concerns. Instead of a sprinkle, processors use a mound. It’s cheap, so there’s little incentive to remove it for economic reasons. Even if consumer pressure mounted to reduce its use, consumers would never buy the salt-free (or even half-salt) products that producers would churn out. Salt is a great flavour-enhancer and masker of unpleasant tastes. Without it, processed food tastes awful. That’s one hell of an obstacle to overcome. To that end, a common thread emerges throughout the book: there have been many times when major figures in the food processing industry have had a crisis of conscience about their business and the effect it’s having on average consumers. But again and again, whenever attempts are made to take a leap and change products for the better, it hurts profits just enough that the business minds buckle to shareholder pressure, often as rival food processors interpret these changes as weakness and make a run to grab market share before their competition comes to its senses. There are enough insider interviews to make it painfully clear that regulation is just about the only thing that can combat these excesses – and it’s even favoured by many industry execs, who, Moss reveals, often avoid eating their company’s products. Everything culminates in a follow-along reading of potato chips, one of the ultimate examples of the salt/sugar/fat combination. Using the knowledge the book has presented to us, it’s easy to understand Moss’s explanation of why they’re such a perfectly devilish food, both terrible for you (the “sugar” effect of the starchy potatoes is worse even than regular sugar) and a triumph of food science. “Bet you can’t eat just one,” indeed. Moss’s tone throughout the book is light and approachable, and what could be dry, dull, preachy reading comes across as a fascinating, compelling narrative, full of genuine people (scientists, marketers, business folks) who just want to make irresistible things that consumers want to buy, insiders who turned away from the business after having a change of heart, and cynical industry types who take a shareholder-centric approach to something as important as public health and alarming rates of obesity that come as an unfortunate side effect of engineering products meant to encourage over-consumption. The research is extensive, and the interviews lend credibility to what could easily have been a preaching-to-the-choir effort. It’s an important book, but it’s not a chore to read. While the subject matter is often tough to swallow, a spoon full of narrative sugar helps this much-needed medicine go down. I really do mean it when I say on the About NEAROF! page that I believe in practising responsible eating. After reading Salt Sugar Fat, I just wonder how realistic a thought that is, given the vast sums spent by food companies on finding ways to exploit human biology and psychology to construct perfectly itch-scratching food products with the same degree of research and precision previously devoted to curing diseases. The deck is stacked, and as eaters – namely, every single person on the planet – we really don’t know what we’re up against. Cost: $32.99 in hardcover (cover price). Currently unavailable in print through Amazon.ca, but still available on Chapters.indigo.ca for $21.77 (as of WordPress time). $14.99 in ebook format through Kobobooks.com and for Kindle through Amazon.ca (as of WordPress time). According to Amazon.ca, the paperback will be out on March 25, 2014. Publisher: Signal (February 2013), 480 print pages. The verdict: Fantastic. If you love food and eating, it’s a great read. If you’re already the kind of person who avoids the centre of the supermarket, you’ll find yourself nodding along a fair bit. But don’t let that scare the rest of you away. Even if your car is littered with Snickers wrappers, you’ll learn enough about the game to be better equipped to play it.